This is a lovely dessert made out of homemade rasgollas. I saw this at Priya’s Blog and immediately bookmarked it. When the Tried and Tasted event was announced I waited no more and prepared it and we all loved it. As I prepared small rasgollas I used 15 nos in this recipe. If you are using store bought ones use 12. Serve it for a party and you are sure to be the centre of attraction. I am sending this to Tried and Tasted event by PJ and started by Lakshmi.and Bookmarked Recipes by Aipi and Priya. Squeeze syrup out of rasgollas. Add the condensed milk and stir it until the condensed milk dissolves. When the milk becomes a little thick add the rasgollas and switch off flame. When serving garnish with sliced pistas. Hi.Had seen this at Priya’s blog too, looks yumm. Yummy n looks soooooooo beautiful! thats my most fav Bengali dessert. you made it so so perfectly. awesome. 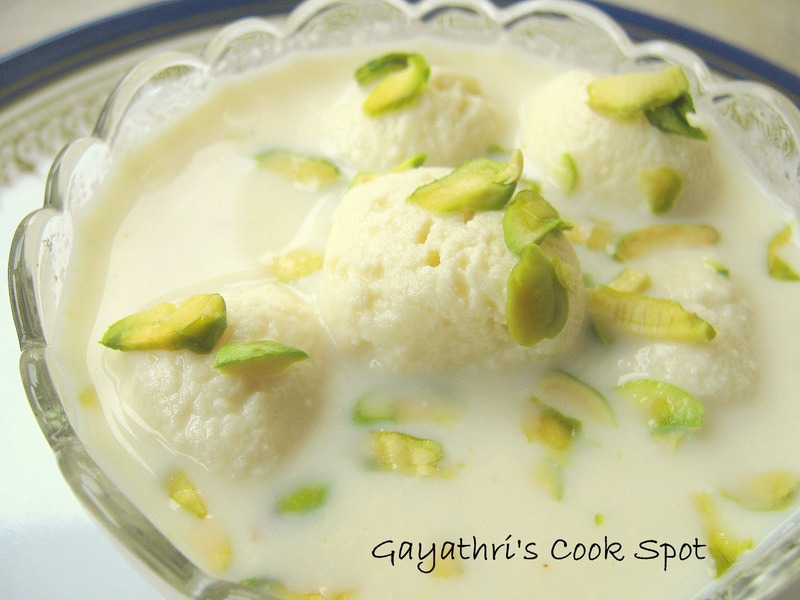 hi gayatri sweet looking great..i like rasgullas,rasmalai very much …u have nice recipe collection..
Rasgulla payesh looks delicious. I have seen it in Priya’s blog too. Nice one. Wow u makes me drool again..very tempting..Thanks for trying Gayathri..
Looks so delicious. I can feel the dish melting in my mouth. Gayathri…..u r making me hungry again. It looks soooo tempting. Ras malai is my fave. dessert. This looks delicious. wow..this is yummy and inviting!